The standard plastic binding combs (AKA GBC or Cerlox combs) are the most commonly used and most economical mechanical comb binder system on the market today. These comb binders are available in lengths to fit most paper sizes, and will allow the user to add and remove sheets as needed. 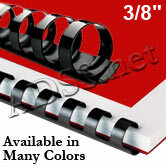 The plastic binding combs on this page have 19 rings to fit an 11" binding edge. They come in a variety of diameters and colors. Plastic binding combs have 19 rings to fit an 11" binding edge. Combs are also available to fit legal size paper. Call now for information on legal and other lengths. Combs are available in sizes from 3/16 inch to 2 inches in diameter. Call now for information on legal and other lengths. Combs from 3/16" to 1 1/8" are round; combs from 1 1/4" to 2" are oval and have locking tabs on the top and bottom. Page capacities shown in the table are the approximate number of 20# sheets. For an more exact fit, measure your finished document and use the sizes under document thickness in the table. Don't forget to include your covers when measuring. If color is critical to your application, please request a sample book, as colors in the online charts may differ due to variations in monitors. Plastic combs are sometimes called spiral combs or spiral bindings. These terms are also used to refer to plastic coil, so check the type you need before purchasing. For most applications, a plastic comb punch and bind machine is the best choice. These machines will punch your paper and covers and open the combs to allow you to bind your books. You can find manual machines for occasional use, and heavy-duty electric punches for more demanding operations. For production environments, you can use a multi-function punch and a separate comb spreader to maximize productivity. Punches are available in manual and electric versions. Comb spreaders are only available as manual machines. When using small combs, set your punch to make the holes closer to the edge of the paper. See your punch's instruction manual for the correct settings. Set the holes as far from the edge as possible when using larger combs. 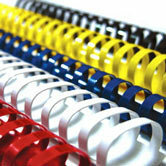 We can print your company name, logo, or document title on custom plastic combs.